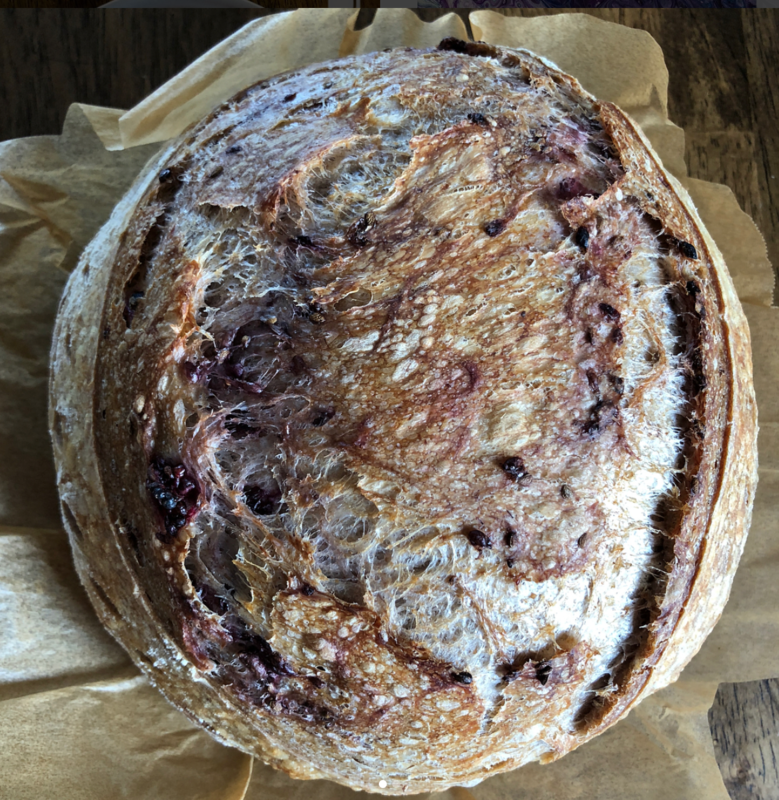 I was experimenting using blackberries in my sourdough recipe. Since its blackberries season here on Vancouver island Canada, I picked a lot. 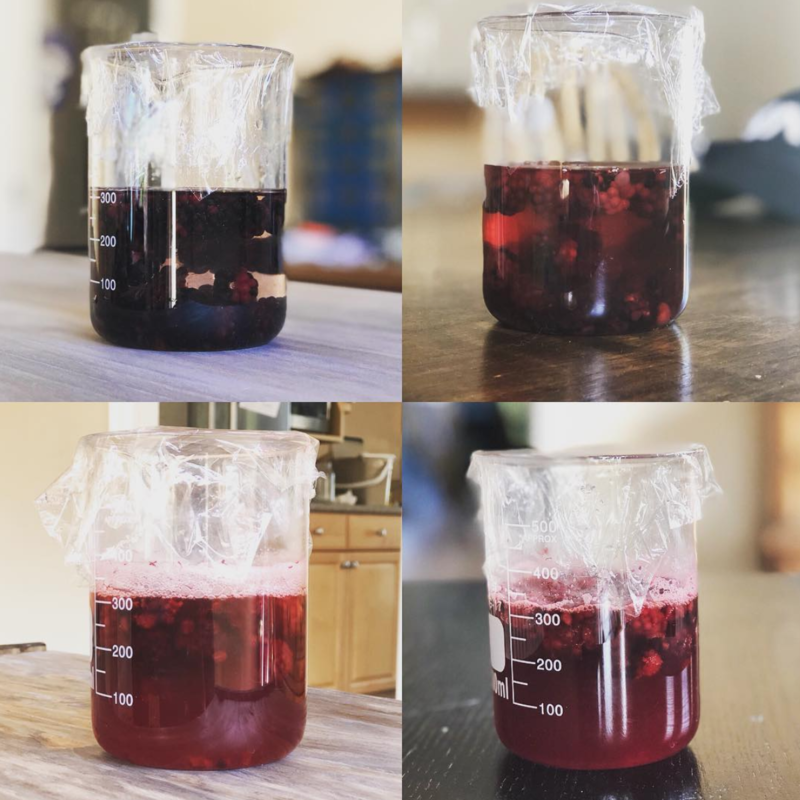 This first attempt I only add blackberries juice into the 2nd mixing (after autolysed with just water and flour) with salt, starter and the juice, I just replaced the water with juice. Obviously, it doesn't give a lot of color to the dough, so I also add the pulp into the mix. Also, I divided the original dough into 2 potions, as I wanted to create the marble bread effect, I combined 2 doughs during final shaping. I didn't expect too much since the colored dough only got a light purple shade. So, this is the final crumb, you can see the subtle color difference. But if I am going to do it again, do you think I can replace water with juice during autolyse to increase color pigment? I know I can also use yeast water to make a levain and this is what I'm planning my 2nd experiment. My blackberries yeast water smell so good, almost like wine. So tempted to just down it. lol. Please give thoughts of making color dough and also using yeast water. Thanks for reading. I've been having the same challenge. 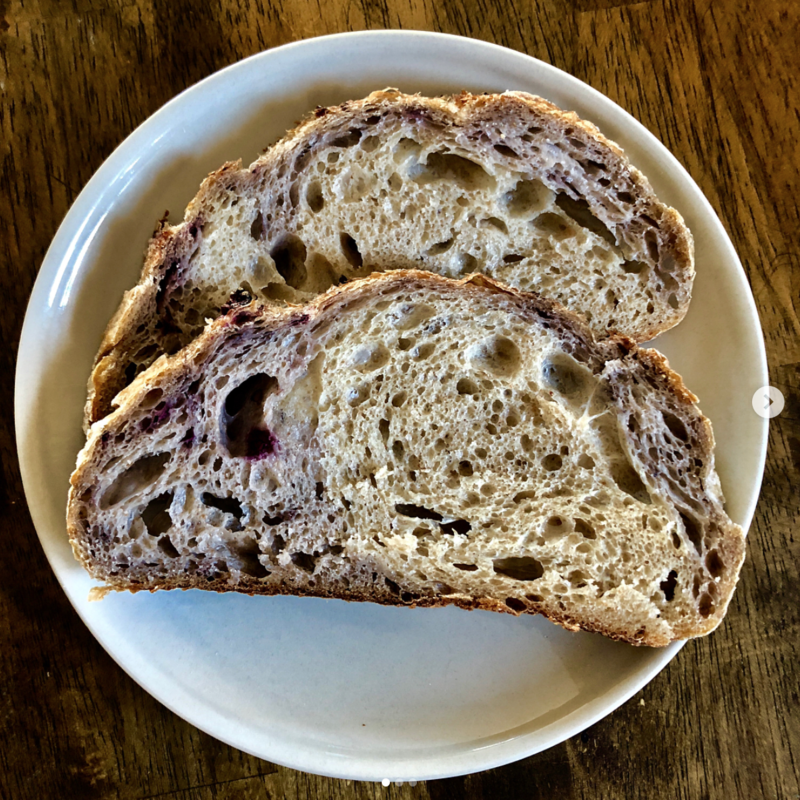 I made a raspberry yeast water bread and it ended up being sort of greyish-blue. I've done a sour cherry one as well and though the yeast water was a luminous red the crumb is very light and creamy. Also, speaking of island blackberries - they ripped out my childhood blackberry picking spot on the island for the McKenzie Interchange. I'm visiting soon and wanted to try and project with blackberries while there. 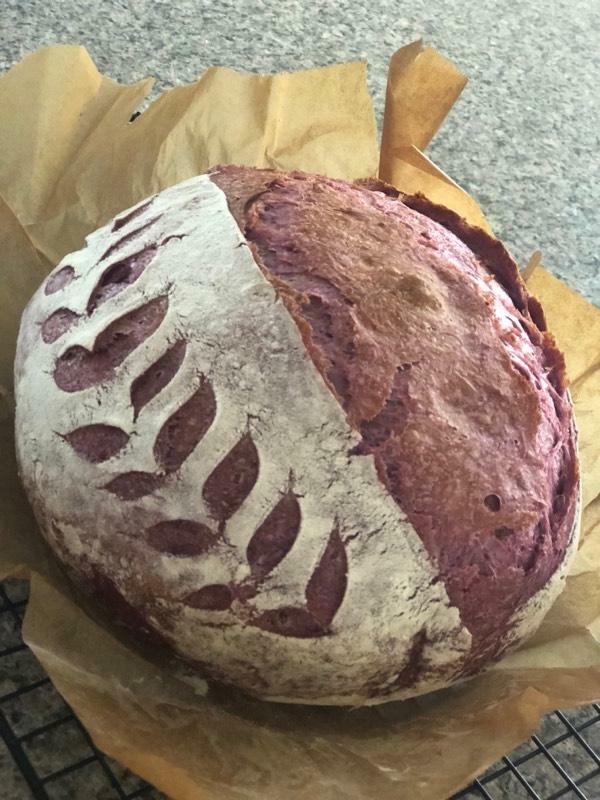 What an absolutely gorgeous bread! If only I could produce that crust! Any tips? Hi Dan, using dutch oven to bake sourdough is the key to have a crust like this one. I bake in DO quite often, but the bloom you got is outstanding! If I had to venture a guess, I say I’m over proofing. I may have just detected something. Your dough goes in as a batard and bakes up into a boule. Your score also looks very deep. 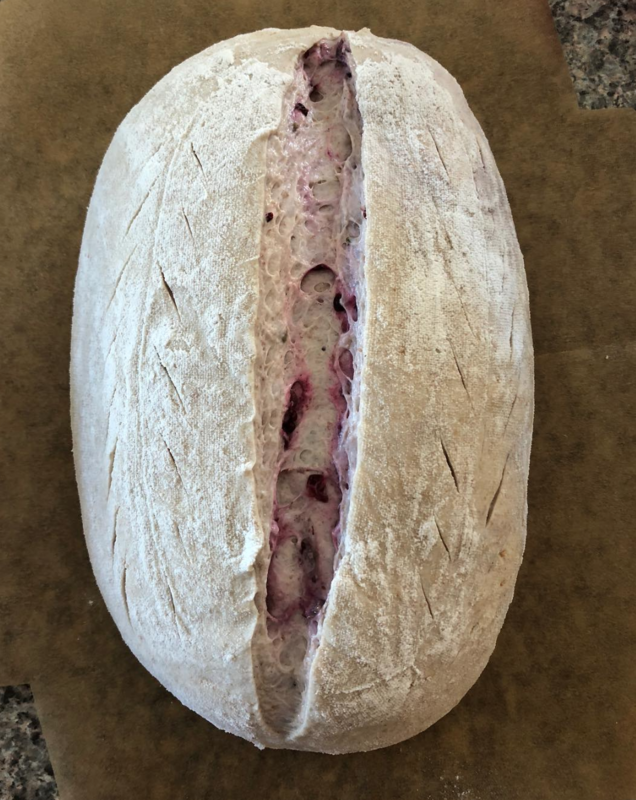 Is this causing the sides of the batard to relax and expand outwards? Am I on to something? like a tablespoon of lemon juice or vinegar to the YW just before adding should help change the blueish-grey tinge towards pinkish. Let it "bleach" first then pour it in. Do you notice a crumb difference where the yeast water was blended into the dough? I haven't tried using yeast water yet. The bread in the photo I was only mixing juice into the dough. It smells really good and tasted blackberries, just the colour is not that outstanding. Color Stability both natural and synthetic, in food is . quite an art. Sometimes acid is good and sometimes it is bad. 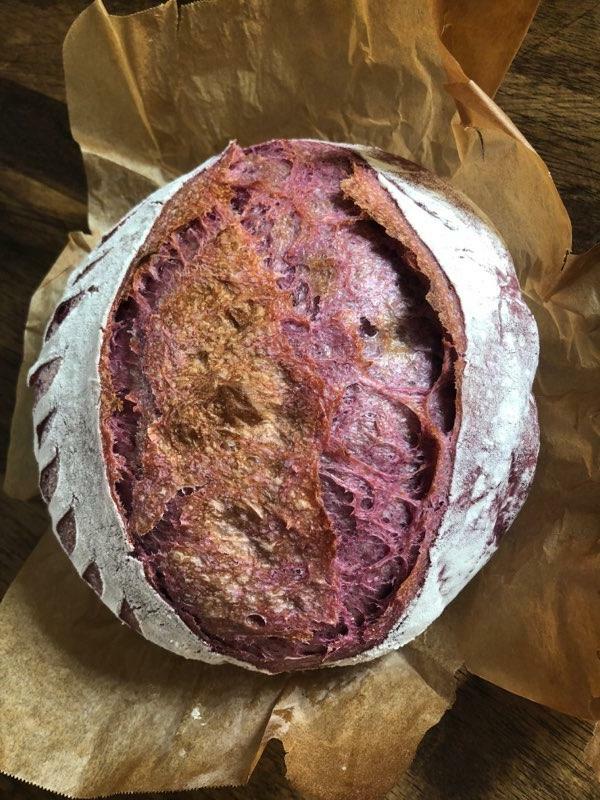 There was a thread a while back discussing how to keep the lovely red colour from beets when the bread is baked. 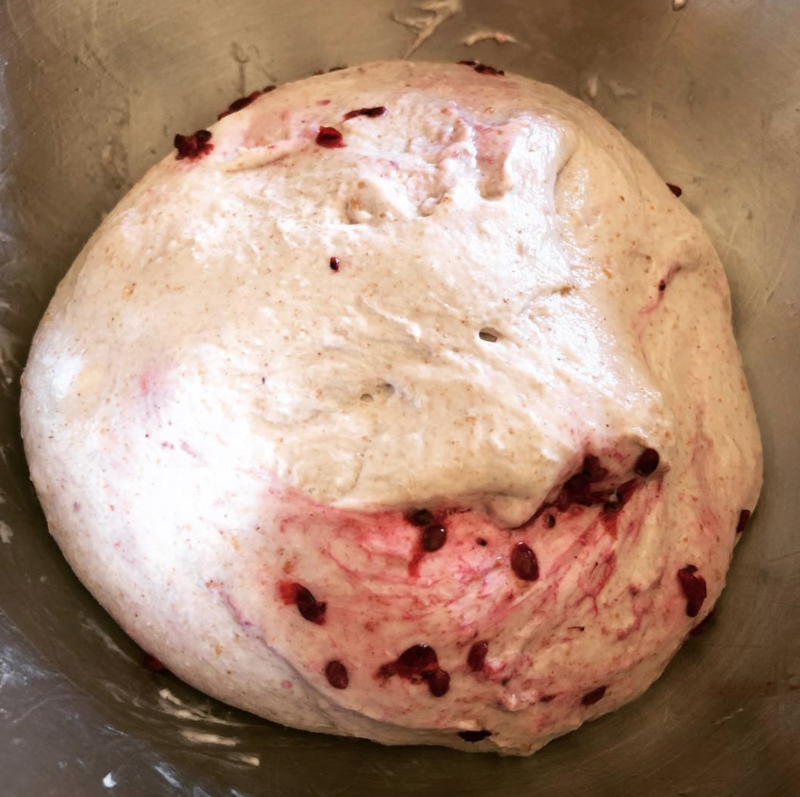 The dough will be an eye-popping magenta, but once it's baked it has only a pink tinge. Someone suggested roasting the beets first, then grating them into the dough (at least that's how I remember it). I wonder if you could either 'roast' the blackberries or perhaps cook the juice down to a syrup? Wonder what that would do? Besides concentrating the sugars, anyway. I live a very short distance away from the big McKenzie construction zone. Lots of noise and dust, that's for sure. I've got a nice little patch of blackberries at the end of my driveway, so don't have to go very far to get some! they featured a show on colored sd bread, very vibrant. the secret they said was to encase the colored dough in a white dough. i haven’t tried it but the contrast was stunning. I am not sure if scoring will defeat getting color if it goes past the white dough. the bread you baked is SOOn beautiful! 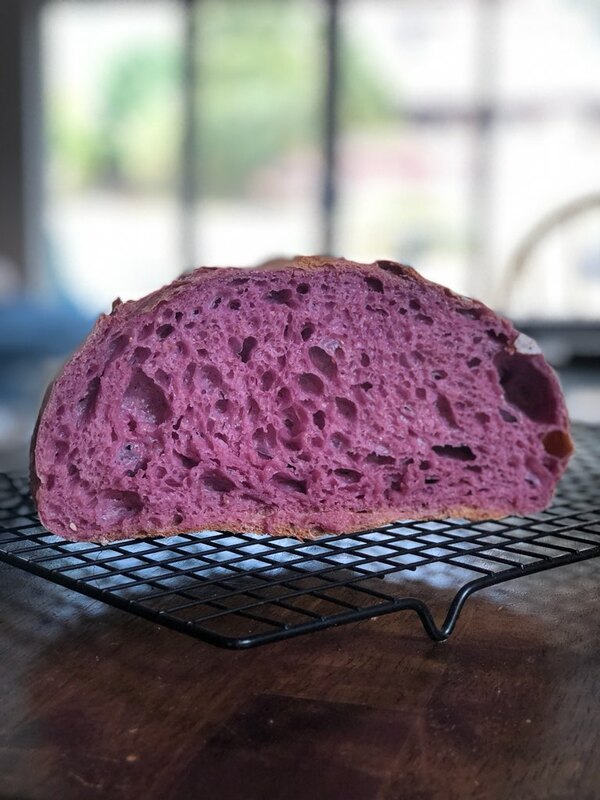 Using purple sweet potato is so far the easiest and best result for coloured bread. Colour is amazing and the bread is very airy and light weighted. Since using sweet potato will make the dough dryer so I use a higher hydration recipe. The crumb is super moist. But after cold proof, the dough is firm enough for scoring. If I ever produce a loaf like this I'll have it stuffed and put it up on the mantelpiece. With a sign next to it "please do not touch". i love the purple in the bread!! grams of cookedv potato to flour? 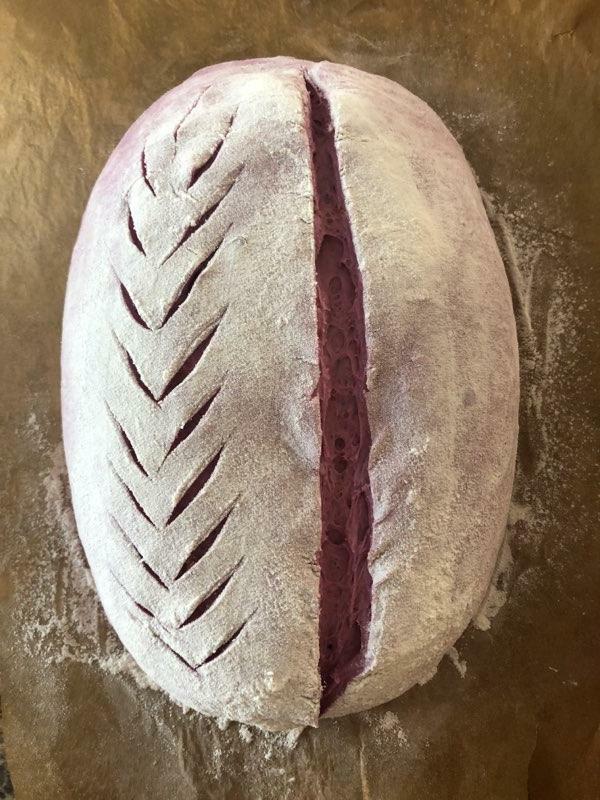 74% bread flour 6%Whole Wheat 20% AP 25% Stiff Leavin 75% hydration 35% purple sweet potato. Will go out for the potatoes this week!